Oh my, what a deliciously disturbing picture. It's about a 7 out of 10, but will linger in your mind a couple days afterward, which is high praise indeed. Remember that moment when the alien in Predator rips a soldier's head off, pulling his spine out with it like a wiry chicken bone? Then, in effect, rears up, turns, arches his back, and howls at the moon with bowed claws dangling at his side? 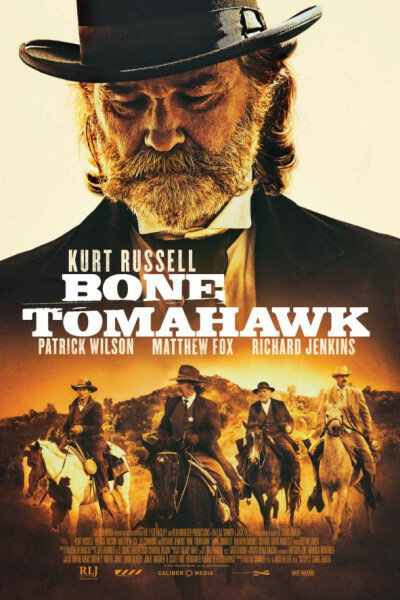 That's Bone Tomahawk, but the predators are an ancient, languageless tribe aptly called troglodytes. It's their total and utter silence, punctuated only by periodic wailing, howling, and bleating through the canyons that creates a mesmerizing cinematic atmosphere. Very ominous, creepy, spine tingling, and blood curdling, in the same way the moor became in 1981's classic An American Werewolf in London. I shall refrain from spoiling any more, up to and including their ritualistic kills, simply leaving you with this one omen: if you thought the 1996 X-Files episode entitled "Home" was creepy, and you liked the first Predator, this film's screaming your name, brother, and you best gird those loins or run like hell.